I have been thinking for a long time now about trying to colour white chocolate ganache. I thought it might be a pipe dream as I know chocolate and water don’t mix, but I had to give it a go anyway. And I am delighted that I did! 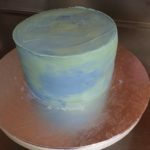 When I started thinking about making this, my first thought was how can I get around the chocolate/water issue and I wondered how well the food colouring would combine with cream. I tried it and to my surprise it worked. I carried on and used my normal ganache recipe and turned out perfectly. My experimental cake was made specially for my father in-laws birthday. The cake is a gluten free chocolate cake (click here for the recipe), and I made a divine raspberry jam for the centre. 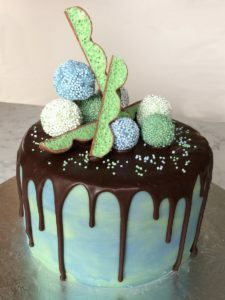 I covered it with my Naturally Colourful white chocolate ganache in green and blue and added the dark chocolate drip on the top. The wee decorations on the top are ganache balls rolled in Naturally Colourful 100’s and 1000’s, as well as a chopped up Aero bar. It went down a real treat! 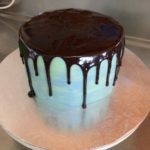 This ganache recipe can be used to cover a cake and also to give the "drip" look on top of a cake. 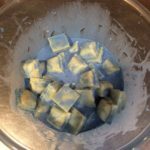 In a microwave safe bowl combine the full fat cream and Naturally Colourful Food Colouring. The colour will be slightly lighter once the ganache is finished, so make it a little darker than you want it. Break the white chocolate into small pieces and add to the bowl with the cream. Give it a mix around. Microwave on a low power for 30 - 60 seconds. You don't want to make it hot as this will burn the chocolate, it should just be slightly warm to touch. 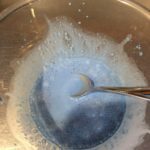 Let it sit for 30 seconds and then hold the bowl between both hands a gently swirl around on the bench so the cream and chocolate start to mix. Microwave again on low power for 30 - 60 seconds, making sure it doesn't get more than slightly warm. 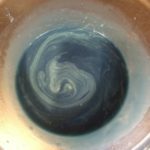 Let it sit again and then swirl it more. Keep repeating these steps until you think all of the chocolate has melted. Once melted get a whisk and whisk it till its super smooth and all the chocolate is fully melted and incorporated. If using to ice a cake, cover and place in the fridge overnight. Take it out of the fridge the next day and allow to come back to room temperature so it is spreadable (or gently re-heat in the microwave). This can also be used immediately as a "drip" on top of a cake, just allow to cool so it doesn't melt the cake. The cake pictured is a 6 inch cake that has two layers of cake in it. In total I used 400g of white chocolate and 132g of cream. To make a dark chocolate ganache (not coloured) use 2 parts dark chocolate to 1 part full fat cream (Eg: 200g chocolate and 100g cream). Follow the same method as for making white chocolate ganache.